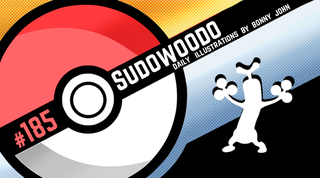 Sneaky Sudowoodo! Pokemon One a Day, Series 2! Sudowoodo, everyone's favorite dancing tree but not really a tree arrives to One a Day! Today's illustration wiggles around a style that carries a cartoon heavy direction with some pseudo-realistic elements to plant details into the mix, loosely inspired by everyone's favorite alien tree thingmabob, GROOOOOT! I originally thought of doing something more realistic in my mind before the pen hit the paper. Groot was my first thought but when the drawing began, I had Sudowoodo's simple but cute face in the way and I thought maybe I could go more cartoony. Still, I wanted to create the element of living wood. Except then I remembered that Sudowoodo is a rock type. So then I applied a more "realistic" filter in my brain to approach the work. I would combine wood and rock to help build up the notion that Sudowood imitates trees for defensive purposes. I decveloped a body that had rock armor with wood splinters and then followed through with Sudowoodo's key features like his crest, his three pronged foliage, and body markings. I settled on using lucious green textured "blobs" to create the leaves, after creating several different approaches in one of the wips to see what I liked best. I then ushered in moss and greens all over the body to give some more character to seal the deal. Create a new Pokemon that might appear to have a logical type due to it's visual design and then reveal it's true typing and why/how it came to be!